The lovely Cinzia from Cindystar is hosting both the English and Italian editions of Weekend Herb Blogging and this week I've found an American apple in Italy called Stayman. I've never seen this apple in Australia so when I saw it here, naturally enough, I had to buy some. 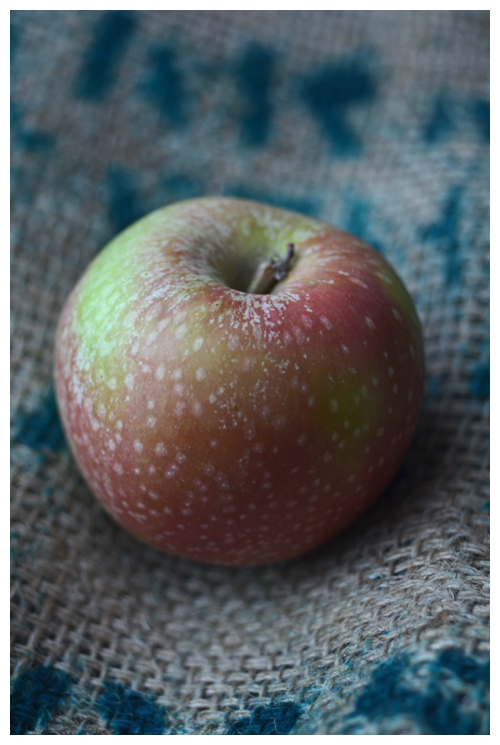 This apple was developed in the 1860's by a Doctor Stayman and it's characterised by the russet/green speckled skin - the flesh itself as a green tinge to it. It makes for an interesting eating apple - at first bite you'll find that it has a lot of flavour and is firm and juicy but there's also quite a bit of tartness but as you take further bites, this tartness actually becomes appealing as it makes the fruit very refreshing. 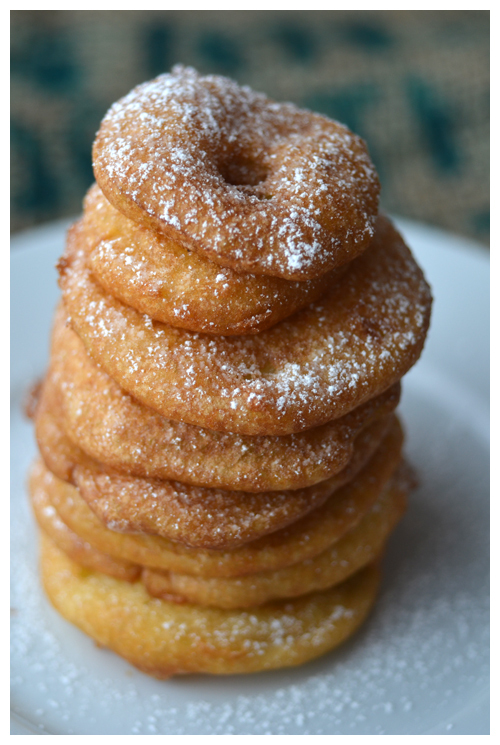 The recipe I'm making is one my mother would make on special occasions - Frittelle di Mele or Apple Fritters. What I love about this recipe is its honesty - if you have a fork you can make the batter and there's no need to rest the batter either. This is especially useful when you're in a holiday apartment that lacks many of the luxuries of your kitchen at home. If you can't find Stayman Apples, use any other cooking apple such as Granny Smith. Sift the plain flour, baking powder and icing sugar together into a bowl. Lightly whisk the egg with your fork and pour it into the flour. Add in milk and then bring the mixture together - you'll need to add enough milk to form a slack batter - how much milk will depend on the absorptive capacity of the flour. Tip in the slices of apple and stir well to coat. Next step is the part that scares most people - deep frying. For sweet dishes use a neutral oil like sunflower. It's best not to cook these in those huge deep fryers - just use a small saucepan and fill it with an 1½inch/3cm of oil. It makes the whole process a lot more controllable and should help remove some of that fear. You need to fry them on both sides until golden, this should take less a minute and then place them on paper towels while you continue frying the rest. Finish them off with a generous sprinkling of icing sugar and serve while still warm. I like tart flavours, and that's quite a pretty apple. Love the fritters, too. This apple looks similar to Mela Campania from the Mantova district. These are tugging at my heart strings! :) You know me and my apples...love them! I'm quite inspired by this simple recipe... I made doughnuts once before at home and it scared me quite a bit... things caught on fire. However, that was four years ago, and I have much more experience now. I think I'll be trying these -- in the saucepan, like you suggest! and I know pretty well what you mean writing about the perfect recipe "when you're in a holiday apartment that lacks many of the luxuries of your kitchen at home"! I am used to take my stand mixer along with me when I go to Elba! :-) ... and also my vaccum cleaner sometimes! :-) ... but that it's a long holiday. have a nice week, how long more in Italy? 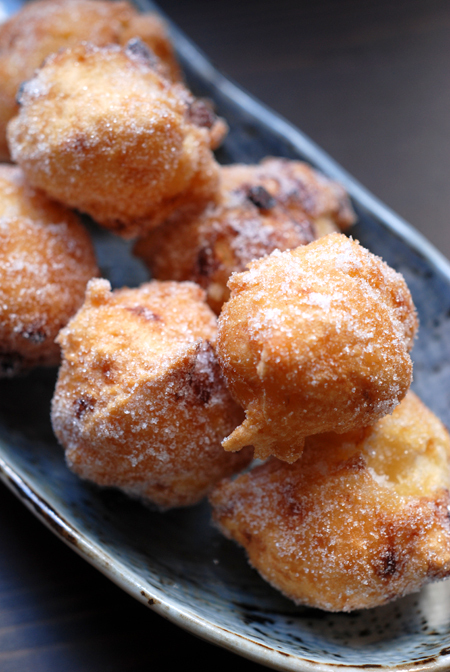 Thanks Leaf - it is a lovely apple and works a treat in these fritters. Thanks Brii - ohh haven't seen those will look for them! Thanks Cinzia - things have happened back home so I'm not sure how much longer I'll be here. What a simple and delicious recipe! I will have to see what kind of apples I can use here.